In the digital age, it is easy to discount printed materials. But don’t! There is a lot of power in print. From business cards and brochures to indoor signage and thank you cards, you can make a large impact on your customer or prospect by utilizing printed products that capture the eye. 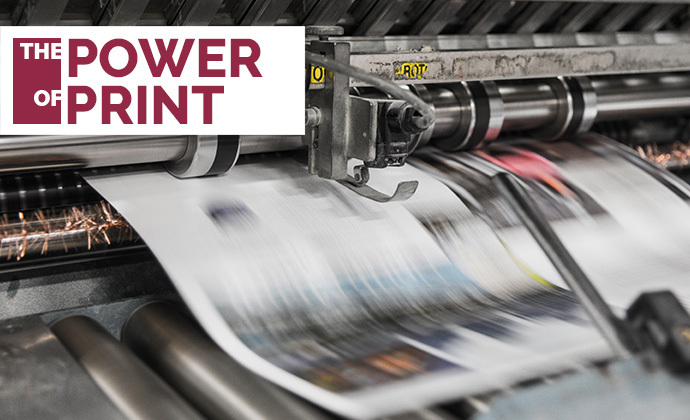 If your printed piece has staying power, your brand will be top of mind when it comes to decision time. Proforma has picked out some essential printed materials for you to consider using in your business. Thank You Geometric – Cards are a wonderful way to show your appreciation. Send this modern thank you card to help you do just that! Plus, thank you cards are not as commonplace as they used to be and they really do make your name/brand stand out. Show that you care about your customers with this beautiful and thoughtful car d.
Business Card, Spot Color – Stand out with an eye-catching and professional spot color business card. Incorporate your brand standards to create continuous awareness while creating a networking resource. Be bold; create a custom business card that displays all your brand colors with a unique design to make your card memorable. 21” x 16” Indoor Pop & Lock Kit – Change posters easily with the Indoor Pop & Lock Kit! This beautiful and modern frame opens like a cabinet so you can swap out posters easily and often. It features a lock so that your posters will be secure until you’re ready to use new materials. Business Card Labels – Ensure you, your brand and your business are easily accessible with Business Card Labels. Place on client samples, direct mail campaigns, sales sheets, brochures, folders and more to maximize your opportunities! While these are some of our suggestions, the options for creating the perfect printed marketing collateral for your business are endless. Call your Proforma Representative today to discuss all of the printing options available via our extensive supplier partner network.